While i was trying to teach my sequence, i started to have a minor panic attack when i gave too much thought into what i was supposed to say. Especially in between transitions of the warrior poses where we have to get the legs positions right. I guess the problem was trying to figure out what to say too much. It is, kind of embarrassing. I’m starting to think, maybe i shouldn’t have gone through the sequence so much because it made me nervous trying to think that my sequence have to be perfect. While practicing at home, somehow when my mind was not thinking of the sequence, trying to figure out what to say comes more naturally and easier. It then got me thinking about how i ace my everyday pitches at work. I don’t even sweat it anymore. Looking at the slides becomes a breeze because i created the deck and presenting it is just trying to sell what i have in my head all the while. I guess the logic is the same. Since i built the sequence, i just have to go through the sequence without trying too hard to make sure i said all the right things. It is actually towards the end of teaching that i started to become more relax because i realise trying to remember everything is sort of too much in the head. I just started to teach base on what i know and words just started to flow naturally. On another note, here’s a nice info graphic i found on prana kosha. 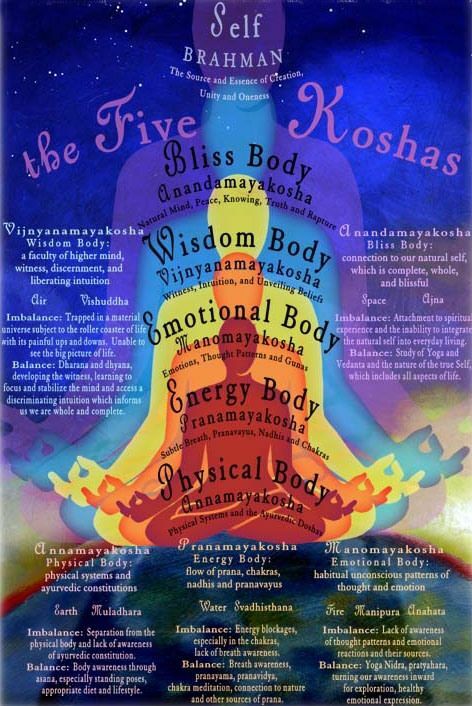 The human body consists of 5 sheats namely; annamaya kosha, pranamaya kosha, manomaya kosha, vijnanamaya kosha and anandamaya kosha.